I saw two two-hander musical gems this past weekend: Her Aching Heart at the Hope Theatre in Islington and, on the opposite side of town, Another Night Before Christmas at the Bridge House Theatre in Penge. 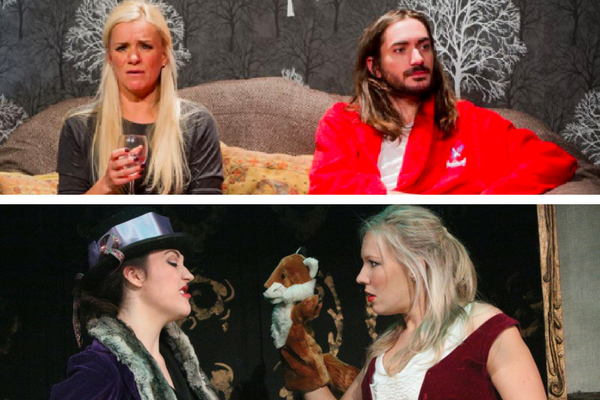 Though they’re on different ends of London’s north-south axis, these two lovely pub theatres have a lot in common, including: similar sizes, a great host pub, hugely welcoming teams and, I reckon from those I spoke to, local audiences with similar tastes. I wonder if the Hope’s Matthew Parker and Bridge House’s Rob Harris might consider some cross-Thames transfers? They could start with these two musicals, both of which end at their home venues on 23 December and deserve a future life. This is the 20th anniversary revival of Bryony Lavery‘s “bodice-ripping musical full of gothic silliness and sapphic tomfoolery”. Harriet and Molly’s modern romance starts to bloom at the same time as both women are losing themselves in the same engrossing book: the fictitious page-turner of the title in which a wilful heiress falls in love with a peasant underling and sets off on a wild adventure involving fox hunts, lecherous aristos, murder, the French Revolution and a Cornish convent. Interestingly, while Lavery wrote the book and lyrics to Her Aching Heart, she allowed for other theatre-makers to impose their own music. Here director Matthew Parker has commissioned Ian Brandon to do just that; in the jaunty score that results, I particularly liked “Good Manners” and “In Love Again”. Colette Eaton and Naomi Todd play all the characters between them (I lost count of just how many) – modern and historic, male and female – and have a hoot doing so. They wring every lightly mocking innuendo out of Lavery’s fantastically floral literary dialogue, “rattling at the knobs… and the knockers” throughout as they race around Rachael Ryan‘s delightful cobbled-together set (when something goes wonky with one of the props, even better). Her Aching Heart continues at the Hope Theatre in Islington until 23 December 2016. With the state of the world as we reach the fag end of 2016, I have to admit I have been pretty bah-humbug myself about this Christmas. So I empathised with Rachael Wooding‘s Carole, an overworked, stressed out Londoner who’d rather retreat than face the world on Christmas Eve. This American musical by Sean Grennan and Leah Okimoto has been subtly Anglicised and updated (spot the Brexit reference) by Rob Harris and director Guy Retallack. And there are some lovely songs, including the plaintive and ultimately uplifting “Please Send Me Christmas”. I guarantee you’ll be feeling more festive by the end of this two hours, especially when George and Rachael lead you and the rest of the audience in a singalong of “Have Yourself a Merry Little Christmas” at the curtain call. It warmed my heart. Below is a little on-set video – Santa questions! – I did with George and Rachel after the show for #StageFaves. Another Night Before Christmas continues at the Bridge House Theatre in Penge until 23 December 2016.